Safeguard your lens with the Lens Cover for Nikon 28-300mm f/3.5-5.6G VR AF from LensCoat. This water-resistant neoprene cover is custom-built to fit tightly around your lens, and helps protect it against bumps and scratches that may occur while you are out shooting. The neoprene material also acts as a thermal barrier between your hands and the lens, making operation more comfortable in extreme heat or cold. To install the cover, simply slide it onto the lens until it fits correctly. Removing it is just as easy, and allows for switching covers quickly while out in the field. 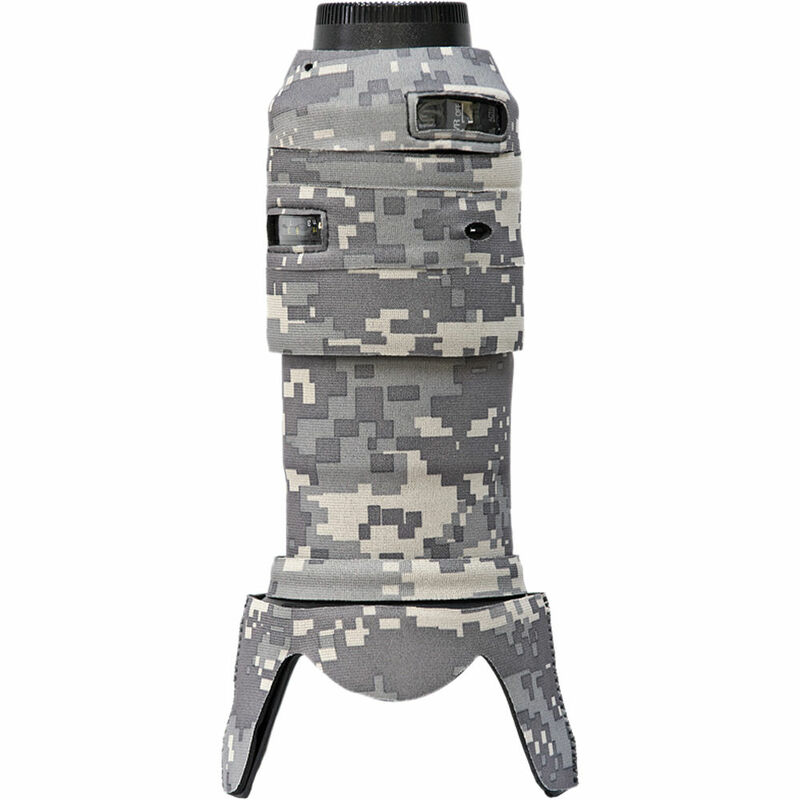 An additional piece can also be installed via hook-and-loop fasteners once the lens is zoomed to 300mm, providing complete coverage even when the lens barrel is fully extended. For simplified operation, the cover features two plastic windows that can be used for viewing the distance scale and auto-focus setting. The digital camo color scheme provides a pixelated pattern that mimics naturally-occurring textures and helps disguise your lens from wildlife. This product is made in the USA. Box Dimensions (LxWxH) 8.1 x 8.0 x 0.3"
Lens Cover for Nikon 28-300mm f/3.5-5.6G VR AF (Digital Camo) is rated 4.0 out of 5 by 6. Rated 4 out of 5 by Newsie from Wet suit for your lens Found this to be a little on the expensive side for what you get.However, I like the protection the lens coat offers. I would reccommend this product to others. Rated 2 out of 5 by DiveWild from Not what I thought These are thick neoprene slips that move and come off when coming in and out of a case and can affect the performance of the lens if they do move. Putting them on each time before using is extremely impractical as it takes a certain amount of time and effort. I thought they were a thin film like adhesive. If I missed that in the description it is by all means, my fault, but I still wouldn't buy again. the cost is not worth the time and effort costs to return. Rated 4 out of 5 by William from Like the extra protection... I have this lens cover on all my 70-300 mm and love the extra protection (and cool camo color! ), so ordered for the Nikon 28-300. While the product is great, it isn't as useful for this particular lens as the other since it is broken up in smaller sections. No issue with the lens cover, just not totally necessary for this particular lens. Rated 4 out of 5 by VideoGuru from nice protection this is a good cover the realtree is a good print matches the rest of my realtree camo. it is a little difficult to focus but it works and will buy more for the other lens I have. Rated 5 out of 5 by A P. from Excellent great product ! !